Sarah Felicia, a singer, songwriter and musician from Ontario, Canada, has released her debut EP 'Take Flight'. From a young age, Sarah had a passion for music and singing. As a child, she would often share her love of music, and performing with others. In her late teens she decided to learn guitar, and once she got to university Sarah felt called to pursue music as a career. 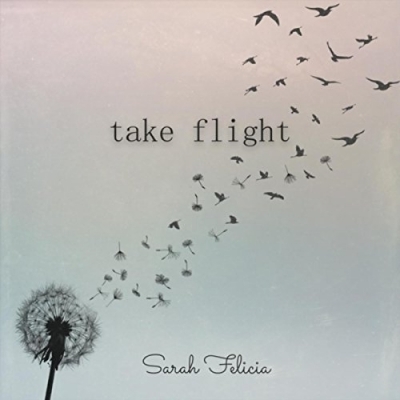 Read More Sarah Felicia, a singer, songwriter and musician from Ontario, Canada, has released her debut EP 'Take Flight'. From a young age, Sarah had a passion for music and singing. As a child, she would often share her love of music, and performing with others. In her late teens she decided to learn guitar, and once she got to university Sarah felt called to pursue music as a career. Soft, rich, intimate and above all, powerful, is my quick description of the vocals of Sarah Felicia, this comes over beautifully on the opening track 'All That Glitters'. The forefront of the song is her vocals and the music is even a little bit secondary to what is going on here. That could be said about the album as a whole. For me personally I actually think musically the song 'All That Glitters' could go up another musical level. It builds and builds and I could imagine a whole big band kicking in, full on drums, big orchestra, big guitars all adding another dimension. This song is so good it has that potential. Yet even saying all that, and it's not meant in a negative way, this song is top top quality. The general feel of this album is an acoustic songwriters kind of album at its heart. That’s what Sarah wants to convey on here and she does it so well. Thankfully she has quality songs to back up that idea. 'One by One' is a beautiful little country number and again her vocals are stunning and the main reason you keep drawn in. A lovely piano riff starts the track 'Take Me Back'. That riff is at the heart and soul of the song. I’m going to say it again, amazing soft vocals here. So I have mentioned Sarah's vocals a few times and if you want an example of how good they are just listen to the clever recording of the vocals on the latter part of the track 'Take Me Back'. Not only clever but stunningly beautiful. The closing track just seems like the perfect way for Sarah to end her album. It’s the perfect example of her as an artist. This is the perfect song for a coffee shop setting gig. This album flew by. It felt like I had only started it and it was back at the start. I just loved it and enjoyed all of it. Personally I think Sarah has so much more to give. I feel this is only the start of something special. But for now she has produced a top quality bunch of songs that I can't recommend more highly. She is a quality song smith. Did I mention how great a singer she is? Well, she is a stunning vocalist. You need to hear her!